It’s been a while since TMTF reviewed anything, mostly because I keep forgetting. “Hold on a second,” I told my typewriter monkeys. “Since when do we do book reviews?” They replied by pointing at the Literature part of the blog’s tagline—Faith, Writing, Video Games, Literature, Life, the Universe and Everything—to which I responded by throwing a copy of Animal Farm at them and telling them to get back to work. Yes, the time has come for another exciting TMTF book review. Today we take a look at The Hollow, a mystery novel featuring Hercule Poirot. Hercule Poirot, the brilliant Belgian with the inimitable mustache, is a legend of detective fiction. I love detective fiction: Sherlock Holmes, Father Brown, Edogawa Conan, Adrian Monk, Lord Peter Wimsey and other investigators amaze, amuse and delight me. I had previously read only one Hercule Poirot novel, and I decided to find out whether he deserves his reputation. I was disappointed. As I read The Hollow, the greatest mystery was how a novel featuring a legendary detective could be so tedious. The novel begins with the dull, day-to-day lives of several characters: Lucy Angkatell, a wealthy lady; Henrietta Savernake, a consummate artist; John Christow, a frustrated doctor; Gerda Christow, his longsuffering wife; and a number of others. One of them is unexpectedly shot beside a swimming pool. The rest become suspects. As they try to resume their usual lives in the wake of the murder, Hercule Poirot steps in to investigate. There are good things to be said about the novel. Unlike much mystery fiction, it doesn’t make the mistake of treating the victim as just a plot device. The suspects’ lives are profoundly affected by the murder, and it’s interesting to watch as their true feelings toward the victim are gradually revealed after his death. While the novel has its strengths, it also has many glaring weaknesses. Apart from Poirot himself, there are hardly any likable characters in the novel. Most of them are painfully shallow, aloof, arrogant, pathetic, egotistical or self-pitying. I didn’t exactly rejoice when the victim shuffled off this mortal coil, but it was certainly a relief to have him gone. Besides the annoying characters, the novel has two serious flaws. First, the mystery and solution are unbelievably dull. There is no clever trick by the criminal; no clever explanation by the detective. The criminal shoots the victim. Late in the novel, the detective quietly stumbles onto the solution. There’s nothing to set apart the mystery from hundreds of similar mysteries. The mystery is eminently forgettable. Second, the story apart from the mystery is equally forgettable. The mediocre mystery wouldn’t be so much of a problem if the novel were well-written and fun to read—but it’s not. As I’ve already mentioned, the characters are unlikable. The literary style is unimpressive. The plot feels insipid. The Hollow is a book I could recommend only to the most devoted fans of detective fiction. For the casual reader of mysteries, I’d suggest a good Sherlock Holmes or Father Brown story. 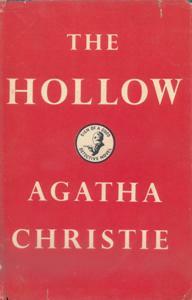 There are probably great Hercule Poirot novels out there somewhere, but The Hollow isn’t one of them. Has anyone discovered a great Hercule Poirot novel out there somewhere? Let us know in the comments! This entry was posted in Literature and tagged book review, typewriter monkeys by Adam Stück. Bookmark the permalink. There are many good Poirot novels. My favorites are Cards on the Table and The Clocks. (The latter has Poirot delivering Christie’s hilarious opinions of other detective fiction, including Chesterton’s.) Other good Poirot novels include The Mysterious Affair at Styles, Peril at End House, Mrs. McGinty’s Dead, Hickory Dickory Dock, and Cat Among the Pigeons (a really zany one which is makes fun of Josephine Tey). A good short-story collection is The Labours of Hercules. I don’t much like the two most famous Poirot novels, The Murder of Roger Ackroyd and Murder on the Orient Express. Also, there are many good Christie novels which don’t feature Poirot. The main thing with Christie is not to focus on any one novel but to become immersed in her distinctive world, as one would with Tolkien or with Wodehouse. The supporting characters in any given Christie novel tend to be shallow, but each represents a stock-character type which, over time, is developed with considerable nuance. This isn’t to say that there are no well-rounded supporting characters: two clear examples are the mystery novelist Ariadne Oliver and the policeman Superintendent Battle, both of whom appear in Cards on the Table. Poirot’s early narrator, Captain Hastings, is rather bland, but Christie has lots of fun at his expense. The really fascinating thing is how Christie’s own attitudes change as she grows older. (She published over a span of more than fifty years.) Her early writings depict a lot of pluck, while her later ones are nostalgic, bewildered, even frightened. I liked Murder on the Orient Express, though it didn’t quite match Sherlock Holmes, Father Brown or Lord Peter Wimsey in my esteem. I suppose I’ll have to read more Poirot novels to get a more complete picture of Christie’s style.